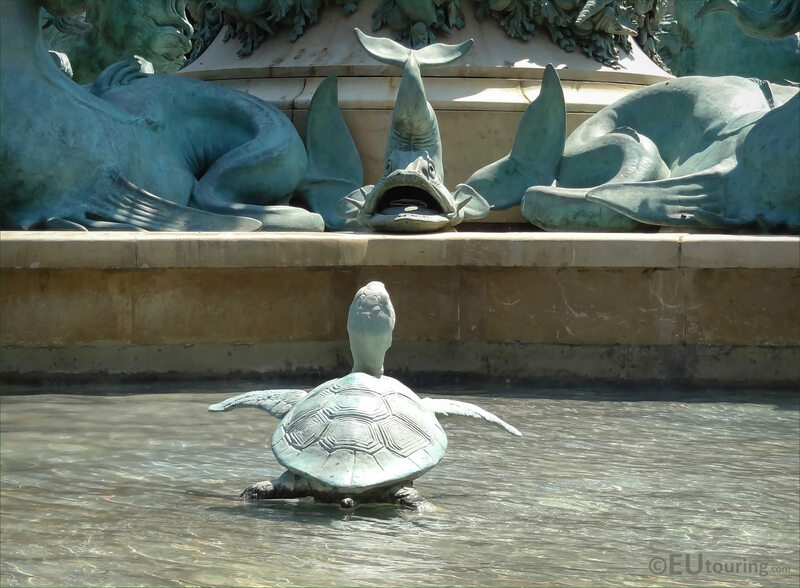 This time we were still at the Fontaine des Quatre Parties du Monde located in the 6th Arrondissement of Paris, when we took these high definition photos showing the dolphins statues on this famous water fountain that were sculpted by Emmanuel Fremiet. 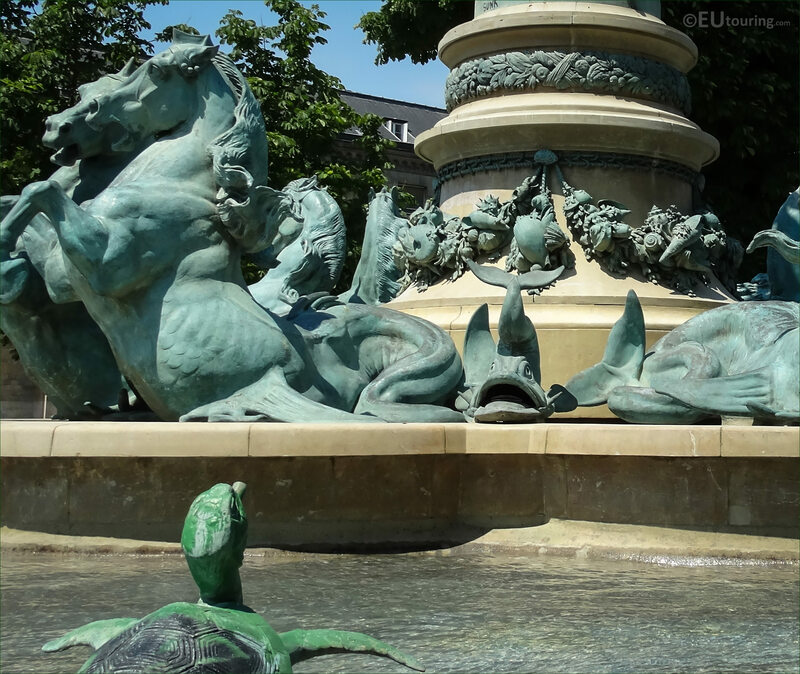 This first close up HD photo shows one of the animal sculptures located on the Fontaine des Quatre Parties du Monde, and although they are classed as dolphins, to us the faces look more like those of a fish. 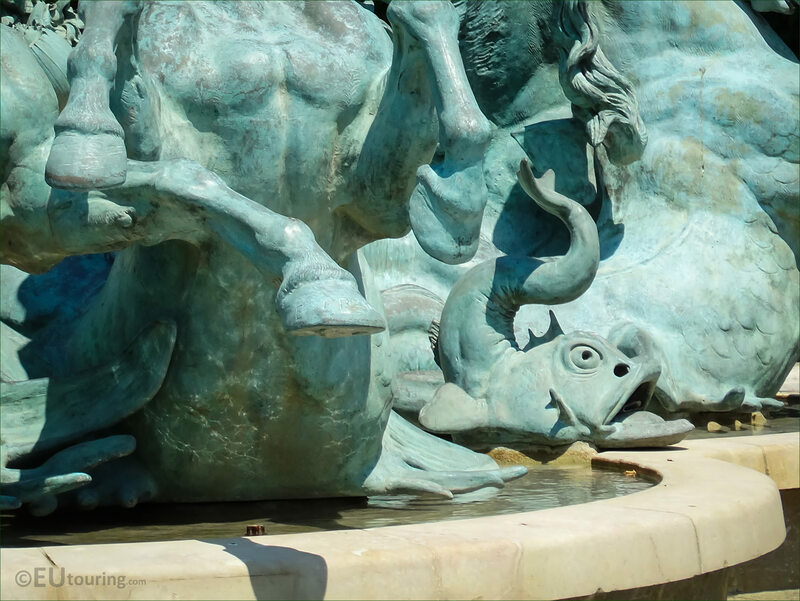 And in this close up you can see a side view of one of the dolphins, which are located in between the horses at the base of the monumental water fountain, and these were designed to spout water into the basin below, but unfortunately this was not happening when we took these photos. 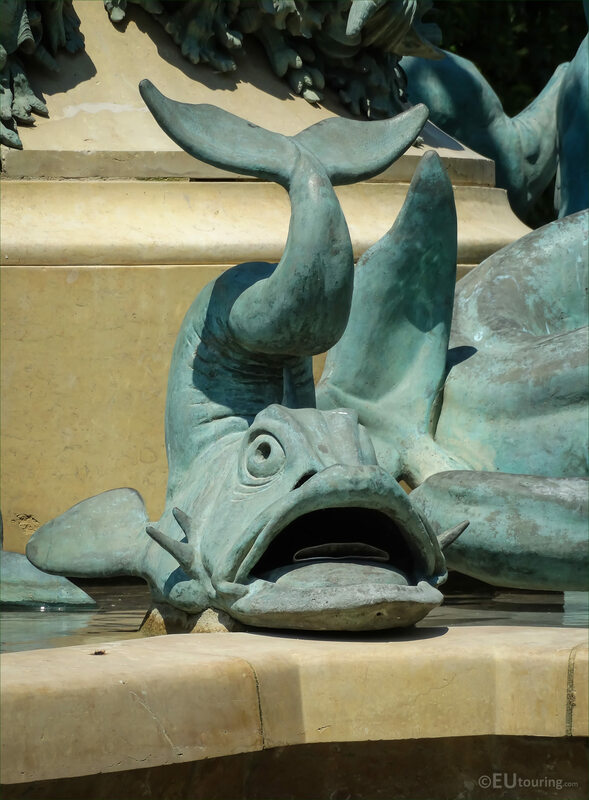 So this monumental fountain is also known as the Fontaine de l'Observatoire or the Carpeaux Fountain, which refers to the main artist who worked on the fountain, yet there were several artists that contributed to the different sculptures, but the bronze dolphins were produced by Emmanuel Fremiet. Now Emmanuel Fremiet was born on 6th December 1824 and like Jean Baptiste Carpeaux, he was also a student of the famous sculptor Francois Rude, yet his main passion was sculpting animals, and Emmanuel Fremiet has become known as one of the best animal sculptors of all time. 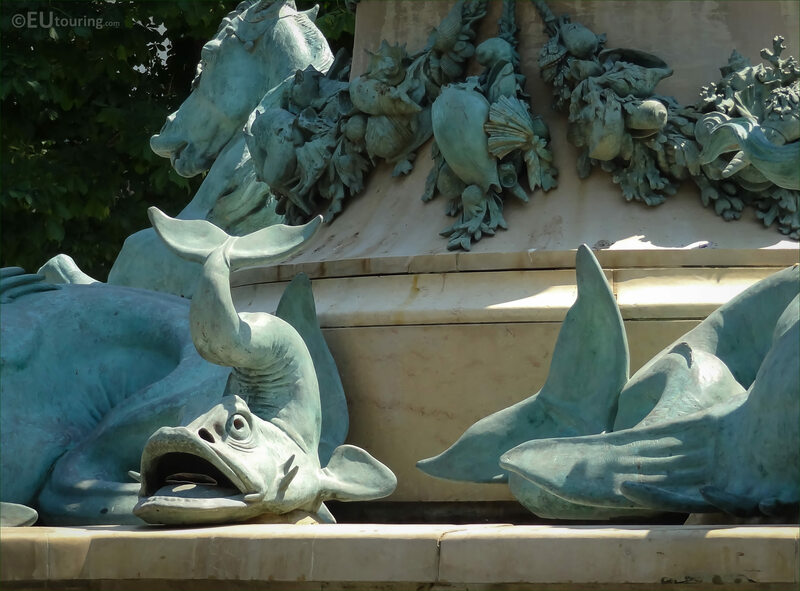 However, in this photograph you can not only see one of the dolphins, but also a turtle within the basin that is also designed to spout water, and these were also sculpted by Emmanuel Fremiet, and all these were cast in bronze after the Paris Commune in the early 1870s. 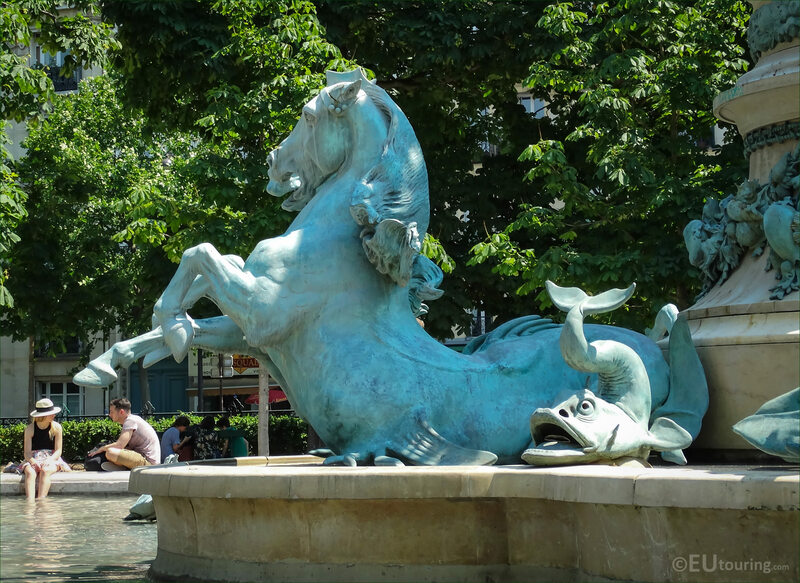 Even though Emmanuel Fremiet is well known for wild animal sculptures, even his first sculpture presented at a Paris Salon was of a Gizelle, his most famous work is the gilded equestrian statue of Joan of Arc on her horse, and in this image you can also see one of the horses that he sculpted for this fountain, located next to the dolphin. 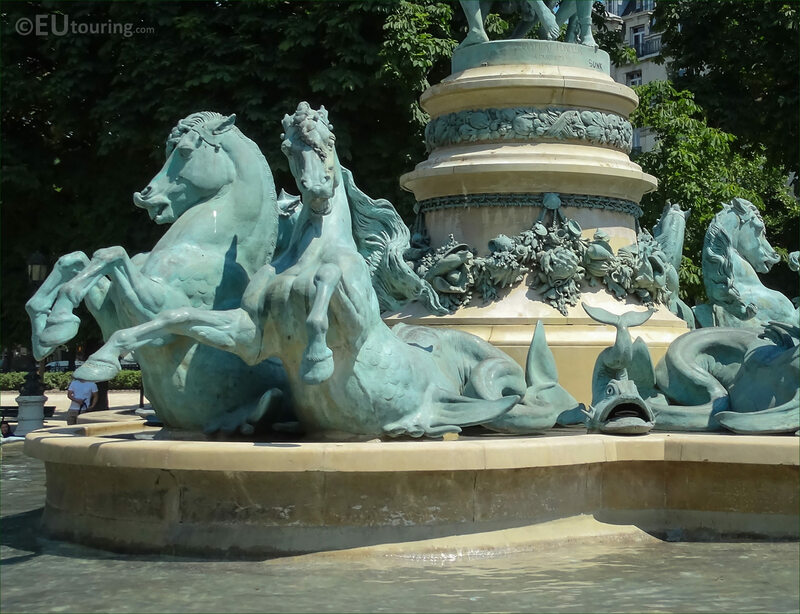 With this last photograph you can see more of the Fontain des Quatre Parties du Monde with the bronze animal statues including another dolphin at the base of the fountain, but Emmanuel Fremiet still continued producing statues and sculptures right through to the start of the 1900s, having a very long and successful career, only passing away in the September of 1910.